Hong Kong (SAR) HONG KONG Hong Kong,Rm 906, 9/F Two Grand Tower 625 Nathan Road Mongkok, H.K. capacity(oz)6.8	upperΦ(mm)78	lowerΦ(mm)52 Height 70	Weight(gm)12 Colour Transparent	pcs/pack 25	packs/Ctn 40	Length(mm) 630	Width(mm) 420	Height(mm) 310 Latest promotion-Jelly Cup, Ice-cream Cup, Mousse Cup, Air Line Cup, Plastic Cup, Beer Cup, Wine Cup，Disposable Tableware. 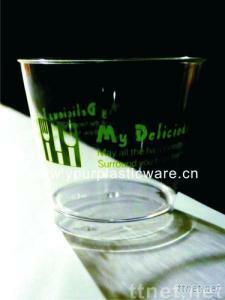 Our products has many different colors such as light blue, orange and transparent etc. Besides, we can also make our product into different design according to customer requirement such as embossmentand logo etc. For enquiries, please feel free to contact us at any time, we will try our best to solve it as soon as possible.